It’s always exciting to catch a sneaky peak of something before it launches – we got to enjoy the new Slush PuppIe pouches at the recent BlogOnX conference before they hit the shelves, blogging really does have its perks! However getting the chance to read and review a book before it is published is something quite special! 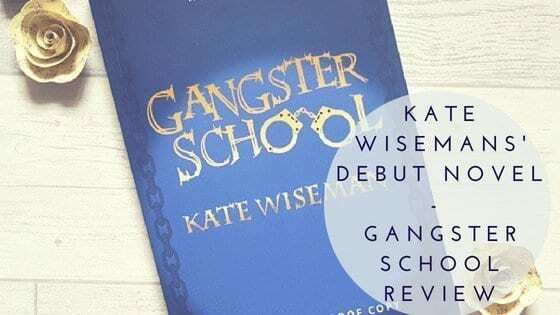 Recently Liv was sent a review copy of Gangster School by Kate Wiseman to read and critique and she absolutely loved it. Very similar to the books she enjoys reading, it is aimed at 6-10 year olds, but for us it is perfect for pre-teens. If your child is a fan of Harry Potter and stories that involve school children breaking the rules, then they are going to love reading Gangster School! Follow the main characters Milly (who is super smart) and her shy, super hacking friend Charlie on many funny and exciting adventures. Will good triumph over the evil villains? Will the fearsome duo conquer over characters such as Pecunia Badpenny and her sidekick Wolf the electronic dog? Milly and Charlie have just started life at Blaggard’s in year 7, run by the evil Head Teacher Greselda Martinet; a school that teaches lying, stealing and kidnapping as opposed to the usual Maths and English. Their parents are master criminals, along with their teachers… so surely they want to follow in their parents footsteps and learn from the best? The book flows easily, making it a good read for children and personally I would say this is aimed more at the older end of 6-10 year scale. Small illustrations mark new chapters, allowing your child to read uninterrupted and once they find a comfy reading space, will not want to put it down! The humour is tongue in cheek and lighthearted, even older children and adults will enjoy reading this book, even if some parts are a tad predictable. Children love to read about naughty school children and the tactics they use to outsmart teachers and it has been great to hear Liv chuckling whilst reading. However, in the end good always triumphs over evil and Milly and Charlie do pave the way nicely for the next book in the series. Already launched in Germany, this is Kate Wiseman’s first novel and has received much acclaim, already being shortlisted for several awards including The Montegrappa Scholastic Prize for New Children’s Writing. Gangster School is being launched in the UK on Monday May 21st and both Liv and I totally recommend buying a copy ASAP. It is the perfect read, especially for the May Half Term! Published by ZunTold Books, you can pick up a copy of Gangster School (available in paperback) from Amazon and book retailers from May 21st, priced at £6.99.